These donations of portable equipment have a value of nearly $70,000. Since 2011, Aseptico has partnered with the Smiles for Everyone Foundation to help the Foundation in its mission to deliver Smiles for Everyone®! by providing free dental care to communities in need. Aseptico played an integral part in helping establish the Foundation’s International Outposts, beginning with Paraguay and expanding into Ghana, Thailand and Nicaragua. Upon each Outpost’s establishment, Aseptico generously donated portable equipment to help with operations, including portable dental chairs, portable dental delivery systems, and portable dental operator stools. They also donated sets of portable equipment for the Smiles for Everyone Foundation to bring along when visiting these Outposts to conduct outreaches with their local partners. Since then, Aseptico has provided routine maintenance for their donated equipment, as well as donated extra equipment including two more set-ups to support the Thailand Outpost’s expansion into Laos and Cambodia. Aseptico has also recently donated one full set-up and two additional operator stools in anticipation of the Foundation’s International Trip to Paraguay this July. These donations of portable equipment have a value of nearly $70,000. As part of the International Smile Project, the Smiles for Everyone Foundation supports dental outreaches in Cambodia, Ghana, Laos, Nicaragua, Paraguay and Thailand. Each year Smile Brands affiliated providers and support staff visit the International Outposts to provide free dental services to people in need. The Smiles for Everyone Foundation and representatives for each country, known as International Ambassadors, continuously support ongoing dental outreaches through grants, strategic guidance and dental mentorships. The Smiles for Everyone Foundation is truly grateful for their partnership with Aseptico and looks forward to their continued joint efforts to deliver Smiles for Everyone®! Since 1975, Aseptico has been committed to manufacturing innovative and high-quality surgical, endodontic and portable dental products. Aseptico continually strives to set the standard for excellence in the dental equipment industry, advancing dental technology with products that are unrivaled in quality and innovation. Aseptico aims to treat their customers and employees with respect in every interaction, offering superior service in a friendly, professional and productive manner. Everything they offer provides great value and is made and serviced in the USA. For more information, visit aseptico.com. The Smiles for Everyone Foundation is a 501(c)(3) nonprofit organization with the mission of delivering smiles for everyone by providing free dental care for those in need, both at home in the U.S. and around the world. Since 2011, the Smiles for Everyone Foundation has delivered over 16,000 smiles and $12 million in donated dentistry. 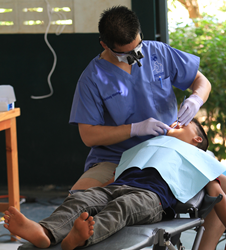 The foundation currently supports programs which provide free dental care to those in need in Cambodia, Ghana, Laos, Nicaragua, Paraguay, Thailand and the United States. For more information or to make a donation, visit http://www.smilesforeveryone.org.